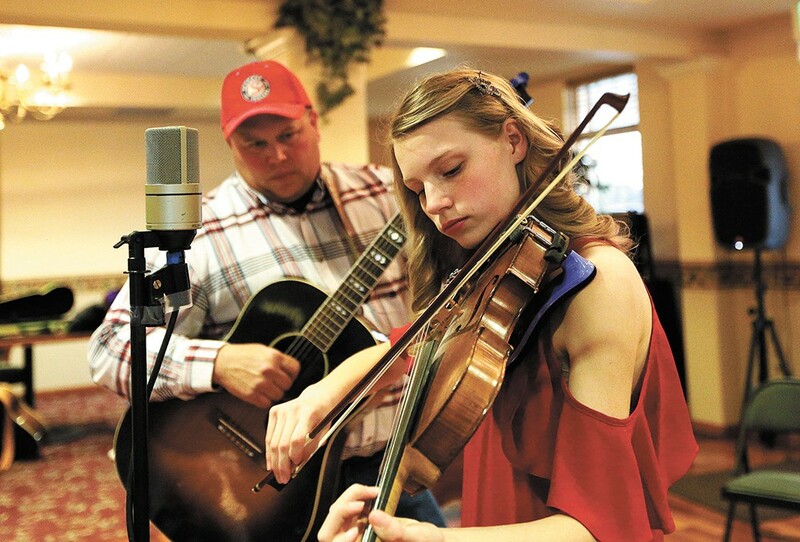 Emilie Miller, 15, accompanied here by her father, Ed, plays in contests around the country. Emilie Miller is tapping her cowboy-booted foot in time to her father Ed's guitar strums. Her flowy red dress sways subtly as she saws on her fiddle and steps up to the microphone to sing. It's early evening on one of the first days that actually feel like spring in the Inland Northwest. Thirty or so residents of the Broadway Court Estates retirement community are on hand, nodding along to Emilie's tunes. She cracks jokes at her dad's expense, offers a little history of songs like "Red Rocking Chair" and "Fall On My Knees," and calls up friends Dan and Olivia Stewart to accompany her on ukulele, guitar or standup bass. Over the hour or so she performs, Emilie and her dad play a couple of rapid-fire runs through hoedowns and waltzes. They explain that when Emilie competes in fiddle competitions, she has to play three tunes in less than four minutes. While that might seem a particularly tough challenge, the smile on her face after she knocks them out make them seem like no sweat at all. "It's really fun to play and it brings joy to other people," Emilie says of the fiddle. "And you can get other people involved because they see you play and they're just, 'Wow!'" In the past month, Emilie has taken her fiddle and traveled from Spokane to Oregon, Montana and Texas to showcase her instrumental skills in competitions against like-minded music lovers with a knack for old-timey tunes. Not bad for a 15-year-old navigating her freshman year of high school and driver's ed at the same time as honing her craft. The Inland Northwest is a hotbed of fiddle music — perhaps an unexpected one for those who associate the instrument with Appalachian mountain music or Texas's Western Swing. The tradition goes back decades when fiddle-playing Okies and Texans fled the Dust Bowl for California, and eventually the Northwest, and it has remained active thanks to fiddle-playing families like the legendary local Ludikers and events like the Northwest Regional Fiddle Contest, celebrating its 50th competition this weekend. The Northwest Regional Fiddle Contest is a family affair for the Millers. Dad Ed has organized the event for more than a decade, having taken over from friends with kids who were contestants until they graduated and moved on, "and the people before that, it was the same thing. You pass it down to the next generation, that's how it works." Ed followed his kids into the world of fiddle contests. His son Drew, now 19, went from curious toddler to champion-level player, and now lives in Texas, where he still competes on occasion. "He saw somebody playing on TV and he said he wanted to play fiddle, he wanted to play bluegrass. He was 3 years old," Ed recalls. Some lessons from JayDean Ludiker soon followed for Drew, and his little sister naturally wanted to follow in her big brother's path. "As soon as she could crawl and get in a case she's had her own fiddle," Ed says. Emilie has competed in every Northwest Regional Fiddle Contest since she was 4. While playing and competing literally involves the whole Miller family — mom Kerri is on hand at Emilie's retirement home performance, writing up the setlist — there's also the larger "fiddle family" that envelops the performing community. Generations of players from throughout the region who have learned from the same teachers and competed in the same contests around the country stay in touch as they move into adulthood. Some become professional musicians like Kimber Ludiker; she plays in Grammy-nominated Americana band Della Mae, who will headline a show Saturday night at the contest. Others pursue different careers while continuing to fiddle on their own time and at weekend competitions. You'll find all types at the Northwest Regionals, where competitors range from 4 years old to 94. Ed Miller says about 80 percent of the 125 or so contestants are 18 and under, like his daughter, who says the contests are a great way to stay close with her fellow fiddling friends. "You get to meet new people, or you get to see pretty close friends that you don't get to see too often," Emilie says. "You just have this really cool experience." For the casual observer, the idea of musicians facing off in a competition might seem odd. After all, we're taught that music is all about artistry and collaboration, so judging instrumentalists and picking "winners" among fiddlers in a slew of divisions from "small fries" to "seniors" might not appear to be too cool. Jenny Anne Mannan, though, says competing was nothing but a positive for her as she was growing up in Colville and taking part in the Northwest Regional Fiddle Contest, the National Oldtime Fiddle Contest in Weiser, Idaho, and other regional competitions. "It can sound kind of funny to call something that's communal and an art form 'competitive,' but it's actually a really welcoming, warm group of people," Mannan says. Mannan is a lifelong fiddle player who grew up performing in her family bluegrass band the Bullas and now organizes the monthly Northwest of Nashville showcases at the Bartlett. The competitions, she says, not only made her a better player, but made her feel part of a community at an important point in her life. "Most people, when they're going through high school, if you're into fiddling, that's not real mainstream. It's a little bit counter-culture," Mannan says. "So to be able to go to these events multiple times a year and be reunited with your friends who are your own age, who know and love this music that you do, that in itself is completely invaluable. • The competition at East Valley High School in Spokane Valley spans two days and features between 100 and 125 contestants. • Each contestant plays three tunes per round of competition: a hoedown, a waltz and a third tune of their choice. They only have four minutes per round to perform all three songs, and no tune can be played in more than one round. • Contestants are judged on timing, danceability, tone and difficulty of their chosen performances. • Judges listen via remote radio broadcast from a room separate from the stage, and don't see the performers, know who is playing at a given time, or hear the audience's reactions. • Competing fiddlers face off in divisions including Small Fry (under 9 years old), Junior Junior (under 13), Junior (13-17), Young Adult (18-36), Adult (37-59), Senior and Senior Senior (60 and up) and Championship Open (open to all ages). • Winners from each division are "certified" to compete at the National Fiddle Contest in Weiser, Idaho, in June. The original print version of this article was headlined "Fiddling, Family & Friends"